In February 1917, the Sopwith Triplane began to appear over the Western Front. The Sopwith swiftly proved itself superior to the Albatros fighters then in use by the Luftstreitkrx�fte. Fokker-Flugzeugwerke responded by converting an unfinished biplane prototype into the V.4, a small, rotary-powered triplane with a steel tube fuselage and thick cantilever wings, first developed during Fokker's government-mandated collaboration with Hugo Junkers. Initial tests revealed that the V.4 had unacceptably high control forces resulting from the use of unbalanced ailerons and elevators. Richthofen first flew 102/17 on 1 September 1917 and shot down two enemy aircraft in the next two days. He reported to the Kogenluft (Kommandierender General der Luftstreitkrx�fte) that the F.I was superior to the Sopwith Triplane. Richthofen recommended that fighter squadrons be reequipped with the new aircraft as soon as possible. The combat evaluation came to an abrupt conclusion when Oberleutnant Kurt Wolff, Staffelfx�hrer of Jasta 11, was shot down in 102/17 on 15 September, and Leutnant Werner Voss, Staffelfx�hrer of Jasta 10, was killed in 103/17 on 23 September. The remaining pre-production aircraft, designated Dr.I, were delivered to Jasta 11. Idflieg issued a production order for 100 triplanes in September, followed by an order for 200 in November. Apart from minor modifications, these aircraft were almost identical to the F.I. The primary distinguishing feature was the addition of wingtip skids, which proved necessary because the aircraft was tricky to land and prone to ground looping. In October, Fokker began delivering the Dr.I to squadrons within Richthofen's Jagdgeschwader I. Compared to the Albatros and Pfalz fighters, the Dr.I offered exceptional maneuverability. Though the ailerons were not very effective, the rudder and elevator controls were light and powerful. Rapid turns, especially to the right, were facilitated by the triplane's marked directional instability. Vizefeldwebel Franz Hemer of Jasta 6 said, "The triplane was my favorite fighting machine because it had such wonderful flying qualities. I could let myself stunt - looping and rolling - and could avoid an enemy by diving with perfect safety. The triplane had to be given up because although it was very maneuverable, it was no longer fast enough." As Hemer noted, the Dr.I was considerably slower than contemporary Allied fighters in level flight and in a dive. While initial rate of climb was excellent, performance fell off dramatically at higher altitudes due to the low compression of the Oberursel Ur.II, a clone of the Le Rhx�ne 9J rotary engine. As the war continued, chronic shortages of castor oil made rotary operation increasingly difficult. The poor quality of German ersatz lubricant resulted in many engine failures, particularly during the summer of 1918. The Dr.I suffered other deficiencies. The pilot's view was poor during takeoff and landing. The cockpit was cramped and furnished with materials of inferior quality. Furthermore, the proximity of the gun butts to the cockpit, combined with inadequate crash padding, left the pilot vulnerable to serious head injury in the event of a crash landing. On 29 October 1917, Leutnant der Reserve Heinrich Gontermann, Staffelfx�hrer of Jasta 15, was performing aerobatics when his triplane broke up. Gontermann was fatally injured in the ensuing crash landing. Leutnant der Reserve Gx�nther Pastor of Jasta 11 was killed two days later when his triplane broke up in level flight. Inspection of the wrecked aircraft showed that the wings had been poorly constructed. Examination of other high-time Dr.Is confirmed these findings. On 2 November, Idflieg grounded all remaining triplanes pending an inquiry. Idflieg convened a Sturzkommission (crash commission) which concluded that poor construction and lack of waterproofing had allowed moisture to destroy the wing. This caused the wing ribs to disintegrate and the ailerons to break away in flight. In response to the crash investigation, Fokker improved quality control on the production line, particularly varnishing of the wing spars and ribs, to combat moisture. Fokker also strengthened the rib structures and the attachment of the auxiliary spars to the ribs. Existing triplanes were repaired and modified at Fokker's expense. After testing a modified wing at Adlershof, Idflieg authorized the triplane's return to service on 28 November 1917. Production resumed in early December. By January 1918, Jastas 6 and 11 were fully equipped with the triplane. Only 14 squadrons used the Dr.I as their primary equipment. Most of these units were part of Jagdgeschwadern I, II, or III. Frontline inventory peaked in late April 1918, with 171 aircraft in service on the Western Front. Despite corrective measures, the Dr.I continued to suffer from wing failures. On 3 February 1918, Leutnant Hans Joachim Wolff of Jasta 11 successfully landed after suffering a failure of the upper wing leading edge and ribs. On 18 March 1918, Lothar von Richthofen, Staffelfx�hrer of Jasta 11, suffered a failure of the upper wing leading edge during combat with Sopwith Camels of No. 73 Squadron and Bristol F.2Bs of No. 62 Squadron. Richthofen was seriously injured in the ensuing crash landing. Postwar research revealed that poor workmanship was not the only cause of the triplane's structural failures. In 1929, National Advisory Committee for Aeronautics (NACA) investigations found that the upper wing carried a higher lift coefficient than the lower wing - at high speeds it could be 2.55 times as much. The triplane's chronic structural problems destroyed any prospect of large-scale orders. Production eventually ended in May 1918, by which time only 320 had been manufactured. The Dr.I was withdrawn from frontline service as the Fokker D.VII entered widespread service in June and July. Jasta 19 was the last squadron to be fully equipped with the Dr.I. Very few triplanes survived the Armistice. Serial 528/17 was retained as a testbed by the Deutschen Versuchsanstalt fx�r Luftfahrt (German Aviation Research Institute) at Adlershof. After being used in the filming of two movies, 528/17 is believed to have crashed sometime in the late 1930s. 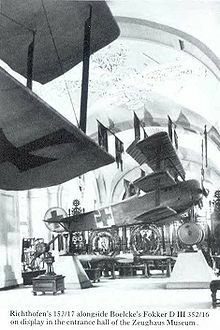 Serial 152/17, in which Manfred von Richthofen obtained three victories, was displayed at the Zeughaus museum in Berlin. The triplane was destroyed by an Allied bombing raid during World War II. Today, only a few original Dr.I artifacts survive in museums. Large numbers of replica aircraft have been built for both individuals and museums. Due to the expense and scarcity of authentic rotary engines, most airworthy replicas are powered by a Warner Scarab or Continental R-670 radial engine. A few, however, feature vintage Le Rhx�ne 9 or reproduction Oberursel Ur.II rotary engines. 2 x� 7.92 mm (.312 in) "Spandau" lMG 08 machine guns. Franks, Norman and Greg VanWyngarden. 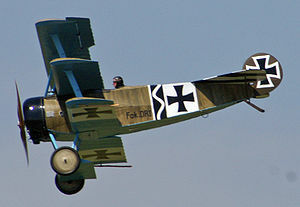 Fokker Dr.I Aces of World War I (Aircraft of The Aces No. 40). Oxford: Osprey Publishing, 2001. ISBN 1-84176-223-7. Loftin Jr., Laurence K. Quest for Performance: The Evolution of Modern Aircraft. NASA Scientific and Technical Information Branch, 2004. Retrieved on 22 April 2006. Nowarra, Heinz J. Fokker Dr.I In Action (Aircraft No. 98). Carrollton, TX: Squadron/Signal Publications, Inc., 1990. ISBN 0-89747-229-2. Vanwyngarden, Greg. Richthofen's Flying Circus: Jagdgeschwader Nr I (Aviation Elite Units No. 16). Oxford: Osprey Publishing, 2004. ISBN 1-84176-726-3.